Sam has recently begun returning home each day with his pockets full of rocks. 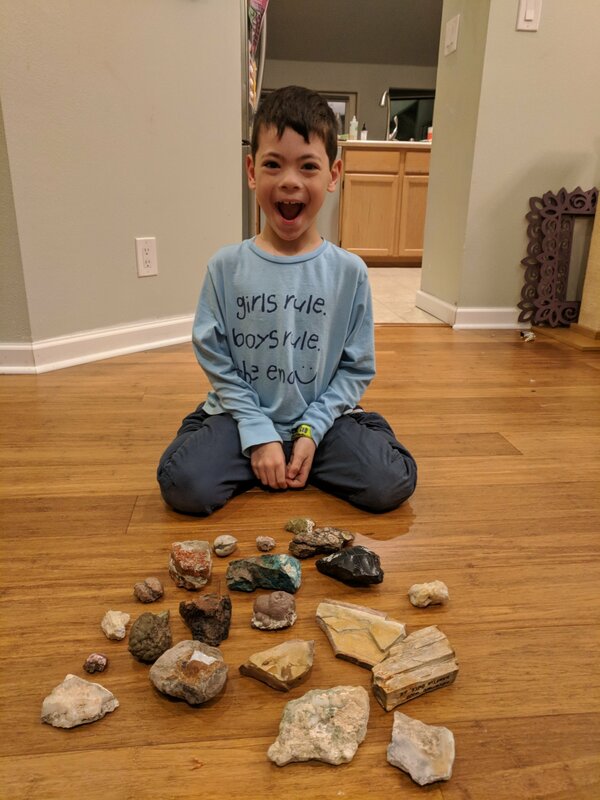 These rocks are being added to his rock collection which he plans to store in a teepee that he wants to build in the backyard. With the exception of the few times that we’ve heard the rocks clunking around in the washing machine, Dave and I hadn’t paid much attention to this new hobby until yesterday. I was complaining to my family about my aching shoulders and need for a massage when Sam said, “Oh! I have a massage rock for that!” and pulled out his finds for the day. That led to all three of us examining the rocks, comparing them and trying to figure out what type of rocks they might be. By the end of the evening, we agreed that we could use some help from the local rock club. Luckily, they had a meeting schedule for the very next day! The rock club’s website says that they have a children’s program at 6:30 followed by a meeting at 7. This is not true. There are no children in the rock club. This is a much older crowd of people who can really geek out on rocks. Sam felt right at home. He placed his rocks on the show-and-tell table. The rock experts each stood up and told the group about the interesting rocks they’d dug up in Nevada or bought at a trade show. Sam ran up to the front of the room all by himself to tell the group that he’d found his three rocks in the garden and the park and he didn’t know what they were. The leader of the group looked at his rocks and decided that they were all granite and that we needed to get Sam some more interesting rocks. A few minutes later, during snack time, he gave Sam a thunder egg. Sam loved this addition to his collection and played with it as he listened to the presentation about a rock show in Tucson (he wants to go next year). The evening ended, way past bedtime, with a raffle. Six participants at the meeting won a bag full of rocks, and we won two of the them. The bags were filled with amazing rocks. 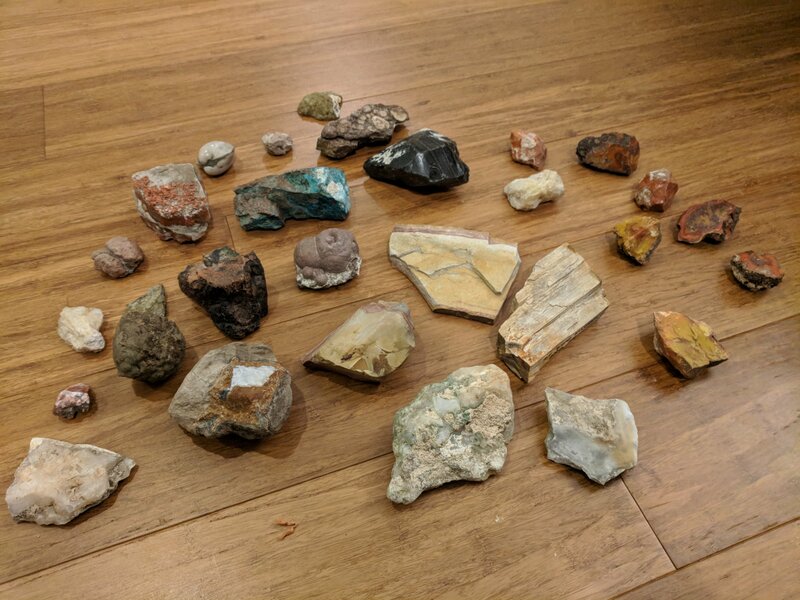 Sam now has an amazing rock collection, and we are about to become people who know a lot about rocks. This year’s project was all about Lego boats. We made 10 boats and then timed them to see how long they would float. When the fist boat was still going strong after 7 minutes in the water, we decided to shift gears and see how many pennies each could hold before sinking. Sam was proud that his own boat could hold the most pennies, while his dad’s boat tipped over immediately and sank. Why all the cats? Sam found some awesome cat tape at the craft store. He had to have it to decorate his poster. Also, he says, cats don’t like getting wet, so they need good boats!